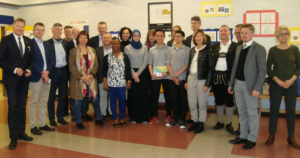 Vancouver – The Bavarian parliamentary commission on education visited the partner region Quebec from April 30 to May 3 to gain insights into the local education system and policies. They attended a presentation by the Montreal School Board (CSDM) of the public school system in Quebec, primarily focused on integration of students with learning disabilities or migration backgrounds. Through various meetings & events they learned more about the integration of students with disabilities or English as a Second Language (ESL) or English Language Learners (ELL). Learn more about their trip to Montreal here: www.baviere-quebec.org, is the “© Vertretung des Freistaats Bayern in Québec”. Their North America visit then took them to Vancouver, where they spent one afternoon at the Vancouver Westside German School (VWGS) accompanied by the Consul General Josef Beck, in “Prince of Wales Secondary” (PW), where they heard a presentation about the German School by Principal Christine Spreter, Board President Hart Mauritz and Vice-President Meike Wernicke. The VWGS is a school with approx 220 students, mixed between DaF (deutsch als Fremdsprache) and DaZ (deutsch als Zweitsprache). The younger students ages 5 to 10 meet at Lord Kitcher Elementary on Tuesdays and the older students 11 to 16 meet at PW on Wednesdays. 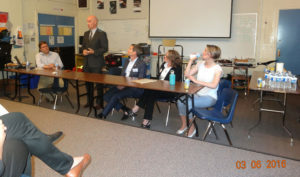 Both parents and teachers were invited to hear the panel discussions and everyone learned a lot. 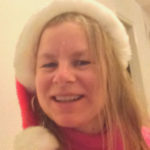 One of the guests was Dr. Anne Rimrott, Ph.D., a Vancouver-based linguist and language consultant working in the area of child multilingualism. Another guest was the incoming Principal Lidija Bakovic, who will be the new Principal at the Westside German School as of September. Axel Rechlin from the Surrey German Language School was also happy to come and take part in the discussion, as he and the Westside German School have worked together on various projects over the years and have a good relationship. 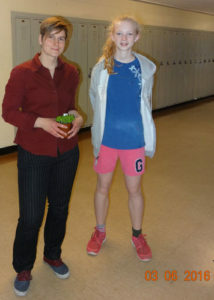 Educator Annett Melhorn and student Natalya Porter from the Senior 3 at the Westside German School. The delegates, were able to spend 15 minutes in a German-school classroom while the students presented a project. The most popular project was a debate on the question: “What was more important, Facebook or the Fall of the Berlin Wall?”. I ended up in a DaF class with an interesting “noise-related project.” The teacher played 8 different sounds, and then the students had 10 minutes to write a story of at least 7 sentences. It seemed like a fun way to practice writing German. The afternoon finished up with a Question & Answer session with PW Principal Dave Derpak. As Prince of Wales has 36% non-English speaking student body, primarily Mandarin or Korean-speaking, the German delegation was interested in learning how the students related to each other under these circumstances. There was also a lot of discussion on how second language classes are chosen by the Vancouver School Board and it seemed like the answer was by supply and demand. The only way you can now learn German in High School in Vancouver is by correspondence. 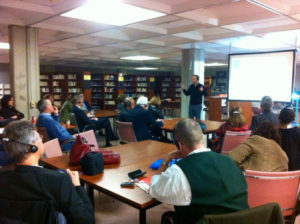 This is why Principal Derpak was happy to host a German School at PW. Translator, Principal Dave Derpak, President of the Board Hart Mauritz, Meike Wernicke, the Vice-President and the Principal of the VWGS Christine Spreter at the Q & A Session. Finally, the commission finished up in Seattle, where the local circumstances, systems and policies will stand at the focus of discussions. The parliamentary commission for education is one of the 13 permanent dedicated commissions of the Bavarian Landtag. It seats 18 MdLs in total, 10 of which from the conservative CSU party, 4 from social-democratic SPD, 2 from Freie Wähler (free voters, liberal), and 2 from Bündnis 90/Die Grünen (green party). Their work mainly focuses on the education policies in Bavaria. In recent years, the commission dealt extensively with the recommendations of the UN Convention on the Rights of Persons with Disabilities, whereby inclusive schools should be put into practice for a better integration of all people into society, be they in need of special education support or not.